Several years ago, writer/director Nancy Meyers fell into a niche by depicting the emotional complications of the lives of highly successful people: an advertising exec magically gets in touch with his feminine side; a movie-trailer editor swaps her mansion for a quaint English cottage to forget about her unfaithful boyfriend; a divorced couple, a wealthy attorney and ritzy bakery owner, reignite a love affair that's interrupted by a charming architect. Prosperity affords these people plenty of freedom to dedicate their attention to more appealing dramatic pursuits, turning the films' attention to lofty ideas about gender awareness, middle-aged perception, and emotional cleansing through a change in surroundings. Meyers' latest, The Intern, again puts her characters in positions of relative comfort -- a meteoric dot-com exec; a retired corporate VP who needs a break from his routine of vacations, tai-chi, and New York shopping -- yet she explores their well-off places in life in pursuit of relevant, albeit saccharine drama that focuses on dedication to one's work and incorporating old-school savvy into new-school commerce. After many years of retirement spent traveling the world, taking courses, and maintaining a daily routine reminiscent of his working life, widower Ben Whittaker (Robert De Niro) starts to feel the itch to do something else with his time. Spotting a flyer about a senior-aged internship with a local e-commerce startup, he decides to apply for the position and, with a little persuasiveness, nails the interviews. He discovers on his first day of work at About the Fit, a modern clothing operation built from the ground up by Jules Ostin (Anne Hathaway), that he's got a lot of ground to cover if he's going to catch up with modern business. Ostin runs a casual but energetic ship that keeps her at the office until late at night, proving to be a demanding position that pulls her away from her family, her daughter and stay-at-home husband, Matt (Anders Holm). Picking up on her issues, Ben finds ways of staying observant and helping the company -- and Jules personally -- wherever he can, often to the discomfort of the control-hungry businesswoman. Nancy Meyers makes her intentions clear from the get-go, shining a light on Ben's enchantingly outdated behavior around the contemporary office while Jules cycles around conducting similar duties that he once conducted in his old job. A bubbly soundtrack carries the cooperative employees across the office's airy and sunny space, captured in bright and energetic cinematography assuring us that About the Fit will remain that kind of impossibly buoyant working environment found only in feel-good movies, both a feature and a flaw in The Intern. Lacking aggressive attitudes -- even Jules, despite employee chatter, is rather mellow -- or significant glitches that can't be fixed with a few clicks of the mouse or unearthed papers, the fluidity of these operations redirects the film's attention toward more personal and dramatically relevant matters: the boss' passion for the company, her waning work-life balance, and how Ben's equipped to help her out. That safe and composed tempo of the New York office, despite plenty of appealing performances that includes Rene Russo as the in-house massage therapist, feels more like a romanticized recruitment video for the fictional company than a robust space for developing characters, though. Instead, The Intern centers on the delightful upward rapport between Ben, a fish-outta-water, and Jules, a capable businesswoman submerged by her responsibilities, and how the seasoned veteran takes the plunge and assists in keeping her afloat. Robert De Niro remains perfectly charming as the conservative intern, enriching his character's disconnect from the digital age -- his bewildered responses to video file extensions and creating a Facebook account are adorably droll -- with tranquil, sagely know-how spreading throughout the office that could feasibly turn the company around overnight if desired by writer/director Meyers (his off-the-cuff analysis of a shipping cost problem sorta does that on a smaller scale). Anne Hathaway lends admirable smoothness to Jules, creating a chic and sympathetic entrepreneur whose time away from her family can be felt in each exhausted bedtime conversation with her husband. She's also stubborn about accepting help with her affairs, naturally, and that's where the chemistry between the two actors fits in: De Niro's optimistic accommodation as Ben makes the gradual breaking-down of Hathaway's cordially guarded barrier pleasant to watch unfold. Where Nancy Meyers ultimately wants to go with her ideas gets complicated as Jules flips between complementing the devotion of her stay-at-home husband and calling for men to be "cool" like Mr. Whittaker: classic, dapper go-getters who wear suits and carry handkerchiefs. 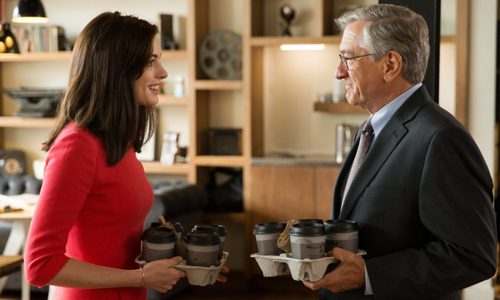 Light on growing conflict and even lighter on laughs, The Intern leans on the integrity of these mixed musings to push it to the end of its cheerful endeavors, while elaborating on Jules' need for upper-management help and how her family can stick together amid transitions in her business. Weightier developments late in the story run the risk of unraveling what Meyers works to accomplish with her progressive depiction of the family, but they're not weighty enough to overcome the heartening influence of our focal seventy-year-old intern, of course. With crowd-pleasing zest, The Intern makes certain to empower its focal characters while expressing what it does about dedicated working women and the value of senior citizens in the workforce.